I think it was Gwyneth Paltrow who said something like ‘I’d rather kill myself than feed my kids Pot Noodle’. 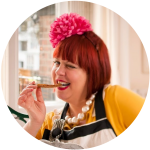 Sorry Gwynie, but I beg to differ – noodles are one of the greatest modern food inventions. Recently in the news, according to a new book Prison Ramen, the most valuable thing you can trade in prison these days is not cigarettes but ramen. This is understandable. Boring food and no access to a kitchen must be one of the most frustrating things about being in prison. 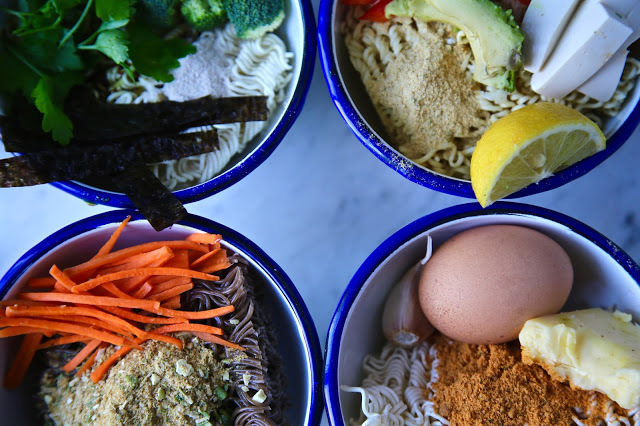 Ramen is the simplest no cook meal you can make, all you need is a boiling water. Ramen is so easy to pimp. Kylie Jenner shared her ramen tricks recently by snapchatting how she pimps ramen with butter, garlic and egg. I tried it and it was pretty good. 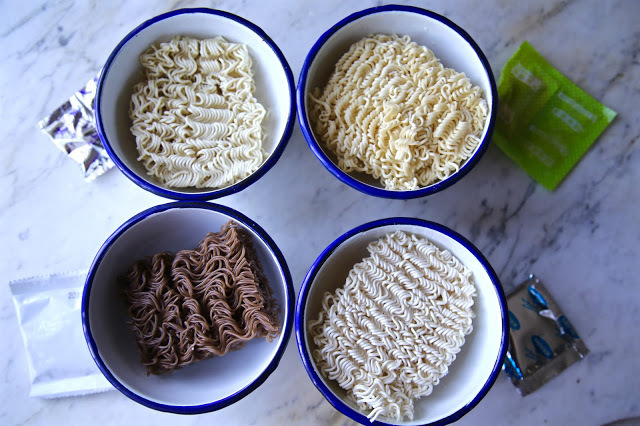 I tried a few different brands of ramen from cheapo to posh. I’ve been told by Asian friends that Korean ramen is the best because it’s ‘bouncier’. 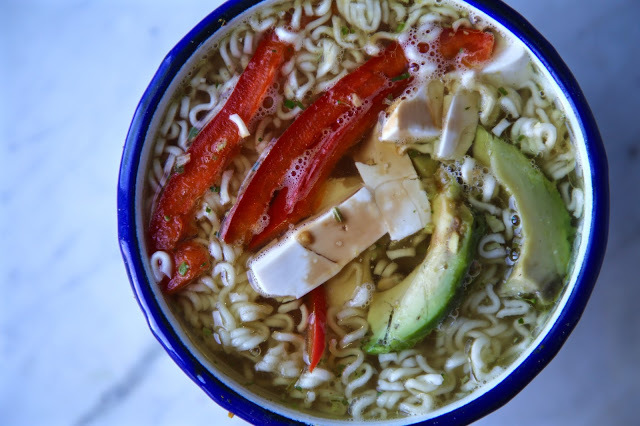 Ramen can be improved with fresh ingredients to take away from that slight cardboardy feel. 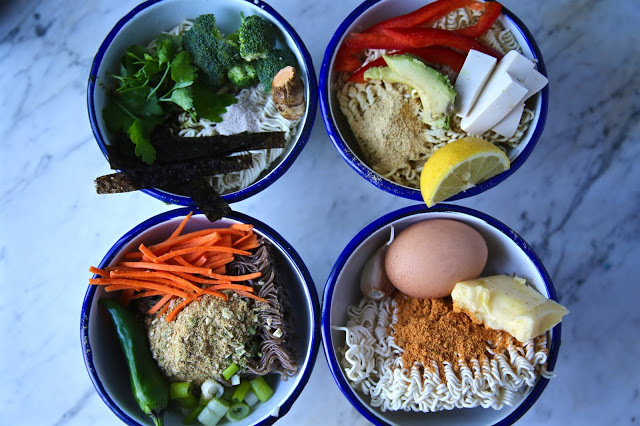 Pimping ramen is a 6 stage process, taking only 10 minutes. 1) Place the ramen in a bowl. 2) Open the sachets that come with it; usually you have a powdered soup, sometimes a packet of oil and rarely a sachet of chilli. I open the powdered soup if it is vegetarian flavour but you could dispense with that and use a stock cube. 3) Boil a kettle and pour it into the bowl of ramen. 4) In the meantime prep the vegetables. 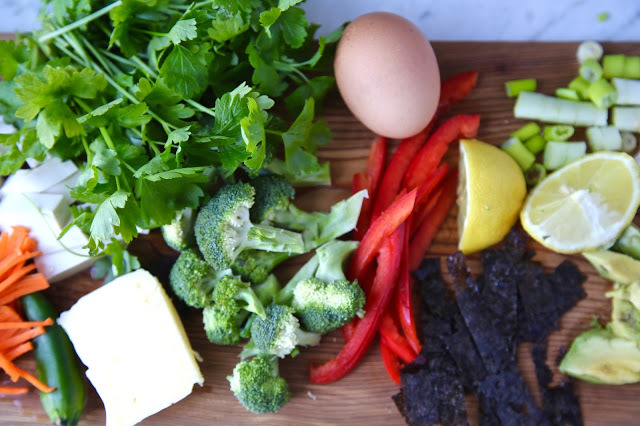 I use tofu cubes, carrot strips, spring onion, red pepper, mushrooms – anything you find in your fridge. 5) Improve the flavour by adding a grating of ginger or fresh turmeric or garlic. Add some fresh herbs like coriander or lime leaves and a squeeze of lemon or lime. 6) Finally a dash of soy sauce, sesame oil or ponzu, a delicious citrussy soy sauce. You can buy it cheaply in supermarkets now. These really makes ramen sing! 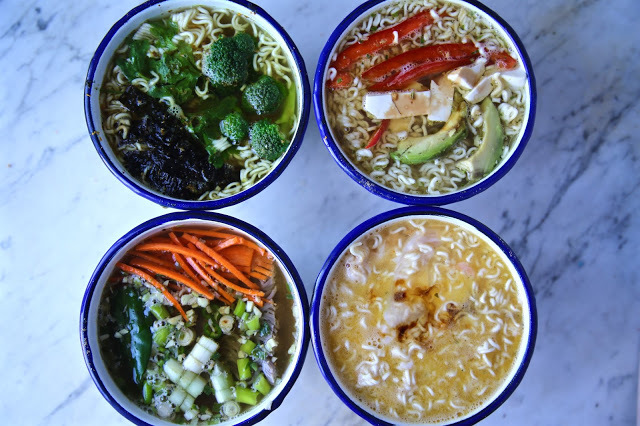 Here are four ideas for ramen bowls. Kylie Jenner adds a big knob of butter, some garlic and a raw egg to her ramen. 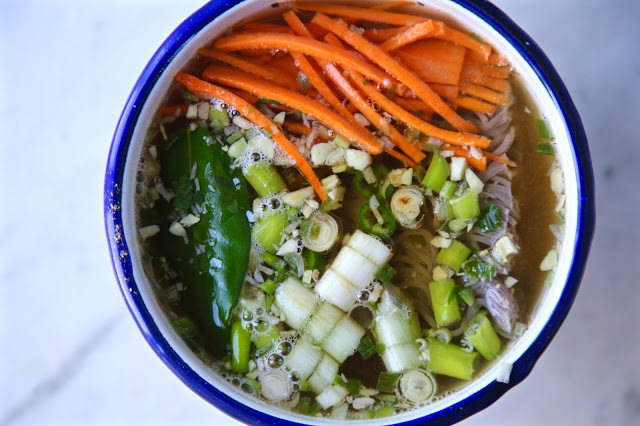 You can add carrot, spring onion, lime leaf, chilli. Or red peppers, tofu, coriander, ginger and avocado on top. Or coriander, broccoli, seaweed, turmeric. Here's mine: throw away the flavor packet. Drain the cooked noodles. 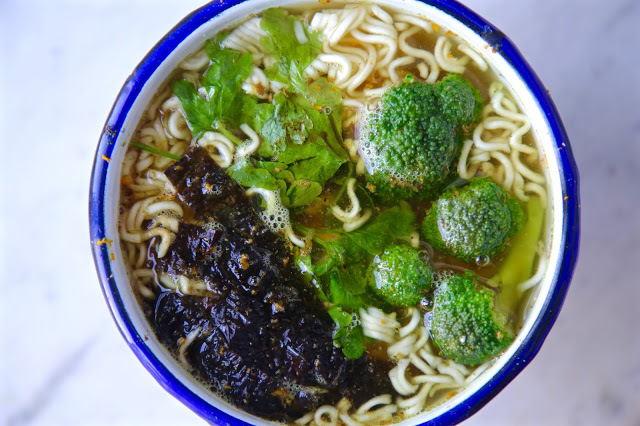 Toss with shredded copy-crab/surimi, steamed broccoli or peas, and a dressing made of mayo and something salty (soy sauce, miso, or fish sauce). It'll be my downfall someday, but I really love mayo. This article should be compulsory reading for all teenagers! 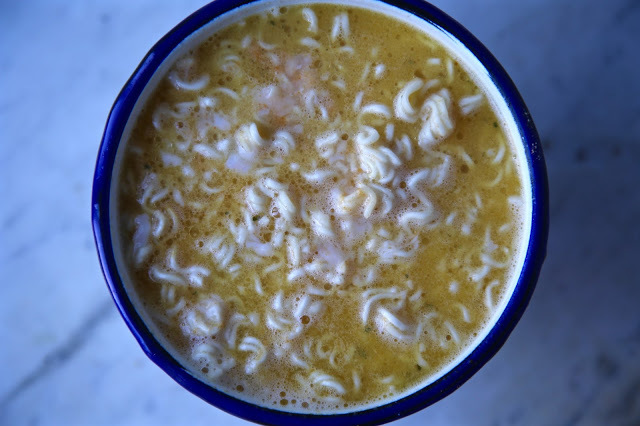 My life was changed when my son discovered he could cook ramen at age 12 thus freeing me up from cooking lunches and snacks. He was a 6' 2" beanpole then and I didnt mind that he added large splodges of mayo and grated cheese. Unfortunately as he filled out he kept these habits which he doesnt thank me for now! I love ramen. My favourite way of cooking is chicken, brocolli, onions and peppers with sweet chilli sauce. How lovely to have a hot tasty meal in 10 minutes when youred tired and cold!